With The Innocents, Bearing Secrets and The Ghosts of Morning, Richard Barre has emerged as “one of the best hard-boiled detective novelists of the ‘90s” (San Francisco Chronicle Book Review). 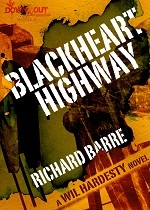 Now, with Blackheart Highway, he takes the genre for the ride of its life. Southern California P.I. Wil Hardesty is a man whose search for the truth always seems to draw him back into his own troubled past, a past shadowed by loss. Doc Whitney was a country music star whose career had just gone platinum when he was convicted for the brutal slayings of his wife and young daughters. Now twenty years later, their paths collide when Doc is paroled from prison and returns to California’s hot, dusty Central Valley…where grudges die hard and the road leads to places best left unexplored. In a town divided over Doc’s release, two people with very different agendas recruit Wil. Once wants the elusive Doc gone permanently. The other is convinced he’s innocent and wants him cleared.